Benjamin Franklin Perkins was born February 6, 1904 in Vernon, Alabama. He was a U.S. Marine and was part of the Marine Corps. stationed to protect the president when Coolidge was President. He also claimed he was involved in secret missions to Latin America. He later became an evangelist who traveled the South and preached at revivals. 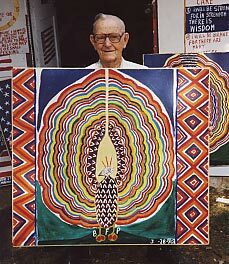 In 1979 following a divorce he returned to Alabama and started painting on his five acre property near his birthplace. He took an art course at a local junior college and soon discovered his passion for art and America. Fueled with religious fervor he turned his studio into an exotic, patriotic place with patterns, flags, and signs often in colors of red, white, and blue on canvas and on gourds. He later painted three themes always in bold bright colors- illustrated stories from the Bible, religious or patriotic scenes and slogans, and quirky objects found in King Tut's tomb at the turn of the Century such as the Sacred Condor and Love Birds. "All my works have a message." B.F. Perkins died doing what he loved best- painting on weekdays and preaching on Sundays. After a third attack he passed away on January 12, 1993 at the age of 88. Today his works are in collections throughout the world.